Biography*: He was an envoy to England to negotiate for the release of King James I of Scotland in 1412. In 1412 he was granted the confirmatory charter for the territorial baronie of Drumlanrig, Hawick and Selkirk. He fought in the French Wars (100 Years War). Biography*: Sir James Douglas, 2nd Earl of Douglas and Mar (c. 1358 – 14 August 1388) was an influential and powerful magnate in the Kingdom of Scotland. He was the eldest son and heir of William Douglas, 1st Earl of Douglas and Margaret, Countess of Mar. By the time his father had made over lands in Liddesdale to him in 1380, he had been knighted, being known as Sir James Douglas of Liddesdale. Earlier his father had been in dispute with King Robert over the latter's succession to King David II, but returned to royal favour by concluding a marriage contract between his son and the Princess Isabel, thus binding the Douglas family close to the throne. In May 1384, the 1st Earl of Douglas died from a fever, and his son inherited. Around the same time a French embassy arrived in Scotland to negotiate a truce between the Franco-Scots Allies and England. While deliberations were taking place in Edinburgh, a further party of French knights arrived at Montrose. These adventurers led by Geoffroi de Charny, sent word to the court at Edinburgh, from Perth where they had marched to, in which they offered their services against the English The new Earl of Douglas, and Sir David Lindsay mustered their men and joined forces with the French knights. They then led a raid into England where they ravaged lands belonging to the Percy Earl of Northumberland, and the Mowbray Earl of Nottingham. While this Chevauchée was happening, the Scots agreed to the tripartite truce on 7 July which was to last until May the following year. De Charny and his knights returned to France but promised to Douglas that they would return as soon as possible. In 1385 when the truce expired, Douglas made war on the English. The French were as good as their word and had previously arrived at Leith with a contingent of Chivalry, armour and monies. The French under Jean de Vienne, Admiral of France joined forces with the Scots. Finding that the army of Richard II of England was numerically superior to the Franco-Scots, Douglas allowed the English to advance to Edinburgh, wisely refusing battle, the English army destroyed the Abbies of Melrose, Newbattle and Dryburgh, as well as burning the burgh of Haddington and the capital itself. Douglas contented himself with a destructive counter-raid on Carlisle and Durham, leading the French, and the men of Galloway, under his cousin Archibald the Grim. Disputes soon arose between the allies, and the French returned home at the end of the year. 1386 saw squabbling between the Earl of Northumberland, and John Neville, 3rd Baron Neville de Raby over the wardenship of the Eastern March. Roger de Clifford, 5th Baron de Clifford, the warden of the Western March, was engaged to keep the peace between the rivals. While Clifford was away from his duties in the west, Douglas accompanied by the Earl of Fife led a force deep into Cumberland, and raided and burnt the town of Cockermouth. In 1388 Richard II had domestic troubles with his recalcitrant barons and was occupied far to the south, and the time seemed right for invasion to avenge the destruction of 1385. The Scots, following an agreement made between the nobility at Aberdeen, mustered at Jedburgh in August, including the levies of the earls of Fife, March, Moray and those of Archibald the Grim. Upon finding from an English spy, that the English warden Percy was aware of the muster, and was planning a counter strike, the Scots command decided to split the army, with Fife leading the main body into Cumberland, while a smaller mounted force under Douglas was to go east and despoil Northumberland. Douglas' force entered England through Redesdale and proceeded south to Brancepeth laying waste to the countryside. From there the turned east to encircle Newcastle. Newcastle was held by Northumberland's sons, Sir Henry Percy, known as "Hotspur", and his brother Sir Ralph Percy. Northumberland himself remained at Alnwick Castle, hoping to outflank Douglas should he attempt to return to Scotland. The Scots, without the siege equipment to invest the Castle, encamped around it. The week that followed saw constant skirmishes and challenges to single combat between the two sides, that culminated when Douglas challenged Hotspur to a duel. In the ensuing joust Douglas successfully felled Hotspur and was able to capture his pennon. According to Froissart, Douglas announced that he would "carry [the pennon] to Scotland and hoist it on my tower, where it may be seen from afar", to which Hotspur retorted "By God! You will never leave Northumberland alive with that." The following day the Scots struck camp and marched to Ponteland where they destroyed its castle, and then on to Otterburn just 30 miles from Newcastle, Douglas appeared to be tarrying to see whether Hotspur would react. Douglas chose his encampment in a wood with an eye to protect his force from English archery. But on the evening of the 5 August, the Percies surprised the Scots and a bloody moonlit battle ensued. Douglas was mortally wounded during the fight, but because of the confusion of fighting in darkness this fact was not transmitted to his men who carried on the battle. Froissart gives account in detail of the various individuals wounded, captured or killed, but what is known is that the Scots won the encounter taking Hotspur and many others prisoner. Douglas' body was found on the field the following day. The Scots, albeit saddened by the loss of their leader, were heartened enough by the victory, to frighten off English reinforcements led by Walter Skirlaw, the Bishop of Durham the following day. Douglas' body was then removed back across the Border and he was interred at Melrose Abbey. The battle, as narrated by Jean Froissart, forms the basis of the English and Scottish ballads The Ballad of Chevy Chase and The Battle of Otterburn. Douglas married Isabel, a daughter of King Robert II of Scotland. He left no legitimate male issue. His natural sons William and Archibald became the ancestors of the families of Douglas of Drumlanrig (see Marquess of Queensberry) and Douglas of Cavers. His sister Isabel inherited the lands and earldom of Mar, and the unentailed estates of Douglas. Isabel arranged for the Bonjedward estate to be passed to their half-sister, Margaret, who became 1st Laird of Bonjedward. [S746] Wikipedia, online http://Wikipedia.com, https://en.wikipedia.org/wiki/Margaret,_Countess_of_Mar. [S746] Wikipedia, online http://Wikipedia.com, https://en.wikipedia.org/wiki/James_Douglas,_2nd_Earl_of_Douglas. Biography*: William Douglas, 1st Earl of Douglas (c. 1327–1384) was a Scottish nobleman, peer, and magnate. William Douglas was the son of Sir Archibald Douglas (died 1333) and Beatrice Lindsay, and nephew of "Sir James the Good", Robert the Bruce's trusted deputy. From the time of his father's death at Halidon Hill, he is described as being a ward of his kinsman and godfather, William Douglas, Knight of Liddesdale and was educated in France. In 1342, under pressure from Liddesdale, his uncle Hugh the Dull resigned the Lordship of Douglas to him, though Liddesdale rapaciously administered his estates while it was in his ward-ship, and assumed direct ownership of some of the Douglas territories. In 1355 the truce with England expired and Douglas with the Earl of Dunbar and March, whose lands had been ravaged, decided to take Norham Castle in retaliation. One of Douglas' captains, Sir William Ramsay of Dalhousie, was instructed to despoil the lands around Norham and burn the town in an effort to entice the garrison out to battle. Ramsay did so and the English under the castle's constable, Sir Thomas Grey of Heaton and Lord Dacre, gave chase. Douglas and March meanwhile were encamped seven miles away in woodland to the south of Duns, when Ramsay had reached them. The English pursuers were ambushed by the Scots force, and completely overwhelmed. Following this Battle of Nesbit Moor, Douglas and March joined with the Earl of Angus in making an assault upon Berwick, but the Scots had to retire from there before the advancing army of Edward III. King Edward laid waste to the Lothians in an event that would be known as the "Burnt Candlemas". His supply lines were overstretched, and following the sinking of his fleet, and the Scots scorched earth policy, Edward had to turn homewards, but not before being ambushed and nearly taken by Lord Douglas's men outside Melrose. Following Edward's retreat into England, Douglas arranged a truce with William de Bohun, 1st Earl of Northampton that would last until Michaelmas. [S746] Wikipedia, online http://Wikipedia.com, https://en.wikipedia.org/wiki/Archibald_Douglas_(died_1333). [S746] Wikipedia, online http://Wikipedia.com, https://en.wikipedia.org/wiki/William_Douglas,_1st_Earl_of_Douglas. Biography*: Margaret of Mar (died c. 1391) was Countess of Mar, an ancient earldom in Scotland, in her own right. She was a daughter of Domhnall II of Mar and after the death of her childless brother Thomas became Countess of Mar. She had married William Douglas, 1st Earl of Douglas, who was succeeded by their son, James Douglas, 2nd Earl of Douglas and Earl of Mar and Garioch in right of his mother. But he was killed in 1388, leading the Scots at the Battle of Otterburn. [S746] Wikipedia, online http://Wikipedia.com, https://en.wikipedia.org/wiki/Domhnall_II,_Earl_of_Mar. Biography*: Sir Archibald Douglas (before 1298 – 19 July 1333) was a Scottish nobleman, Guardian of Scotland, and military leader. He is sometimes given the epithet "Tyneman" (Old Scots: Loser), but this may be a reference to his great-nephew Archibald Douglas, 4th Earl of Douglas. The younger son of Sir William "le Hardi" Douglas, the Governor of the castle at Berwick-upon-Tweed, and his wife, Eleanor de Lovaine. Douglas was also half-brother of "the Good" Sir James Douglas, King Robert the Bruce's deputy. Douglas is first heard of in 1320 when he received a charter of land at Morebattle in Roxburghshire and Kirkandrews in Dumfriesshire from King Robert. In 1324, he was recorded as being granted the lands of Rattray and Crimond in Buchan and the lands of Conveth, Kincardineshire, already being possession of Cavers in Roxburghshire, Drumlanrig and Terregles in Dumfriesshire, and the lands of West Calder in Midlothian. By the time of his death, he was also in possession of Liddesdale. Following the death of King Robert I and his brother's crusade with the dead king's heart, Douglas once again becomes of note. He was made guardian of the kingdom since he was "the principal adviser in...the confounding of the king" as much as he was heir to his brothers influence after Murray's capture. Archibald's success in local raids though, did not prepare him for full-scale conflict. During the Second War of Scottish Independence, Edward Baliol, son of King John of Scotland, had invaded Scotland with the backing of Edward III of England, inflicting a defeat on the Scots at the Battle of Dupplin Moor. Douglas served under the dubious leadership of Patrick V, Earl of Dunbar leader of the second army that aimed to crush the smaller Balliol force. Following the rout of the Earl of Mar's force Dunbar did not engage the disinherited but retreated allowing Edward Balliol to be crowned at Scone. Following this battle, and as a sweetener to the English, Edward Baliol agreed to cede the county, town and castle of Berwick to England in perpetuity. However Douglas led a Bruce loyalist defeat on Balliol at the Battle of Annan, forcing him to flee back to England. Edward III himself came north to command his army, and laid siege to Berwick. However, a temporary truce was declared with the stipulation that if not relieved within a set time, Sir Alexander Seton, the governor, would deliver the castle to the English. Douglas raised an army to relieve the beleaguered defenders of Berwick. As a feint to draw the English away he invaded Northumberland, but was forced to return to Berwick when the English refused to be lured. On 19 July, Edward's army took positions at the summit of Halidon Hill, a summit some mile and a half north of the town with commanding views of the surrounding country. 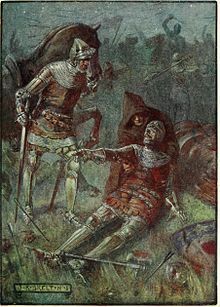 Douglas' numerically superior force was compelled to attack up the slope and were slaughtered by the English archers, a prelude, perhaps, to the battles of Crécy and Agincourt. The English won the field with little loss of life, however by the close of the fight, countless Scots common soldiery, five Scots Earls and the Guardian Douglas lay dead. The following day Berwick capitulated. Archibald was succeeded by his son, William Douglas, 1st Earl of Douglas. Sir Archibald Douglas married Beatrice Lindsay, daughter of Sir Alexander Lindsay of Crawford, an ancestor of the Earls of Crawford. They had three children. Biography*: He succeeded as the 8th Earl of Mar [S., c. 1115] before September 1305. He was reared at King Edward I's court in England. He held the office of Keeper of Newark Castle in January 1321/22.3 In 1327 he raised a force in Scotland and invaded England seeking to restore King Edward II. He held the office of Regent of Scotland in 1332. He fought in the Battle of Dupplin Muir on 12 August 1332. Domhnall II, Earl of Mar (1293 – 11 August 1332) was Regent of Scotland for just over a week during the minority of David II, King of Scotland. Domhnall's father was Gartnait, Earl of Mar. His mother's identity is uncertain, although she seems to have been an elder daughter of Robert Bruce, Earl of Carrick. It appears likely that he fought on the side of Edward II of England at the Battle of Boroughbridge in March 1322, as it is recorded that afterwards the Earl of Mar took Bartholomew de Badlesmere, who was one of Edward's captured opponents, to Canterbury. In 1332 the regent of Scotland, Thomas Randolph, 1st Earl of Moray, died. On 2 August Domhnall was elected as the new regent at a meeting of the Scottish nobles at Perth. Following the invasion of Edward Balliol, with the support of Edward III of England, Mar led the Scots loyalists to confront them. He was defeated and killed at the Battle of Dupplin Moor, only nine days after his election as regent.